Son of Man Ballantine (1971) ISBN 0-345-02277-7, Panther (1979) ISBN 0-586-04807-3, Warner (1987) ISBN 0-446-34511-3, Pyr (2008) ISBN 978-1-59102-646-4. Silverberg, Robert (1960). Treasures beneath the sea. Illustrated by Norman Kenyon. Racine: Whitman. Black, Edgar (pseud.) (1961). Sir Winston Churchill : the compelling life story of one of the towering figures of the 20th Century. Derby, Conn.: Monarch Books. Silverberg, Robert (1961). First American into space. Derby, Conn.: Monarch Books. — (1962). Lost cities and vanished civilizations. Philadelphia: Chilton. Silverberg, Robert (August 2012). "Big-Endians/Little-Endians". Asimov's Science Fiction. 36 (8): 6–8. — (September 2012). "Anthologies". Asimov's Science Fiction. 36 (9): 7–10. — (October–November 2012). "Decline and fall". Asimov's Science Fiction. 36 (10&11): 6–8. — (December 2012). "Libraries" (PDF). 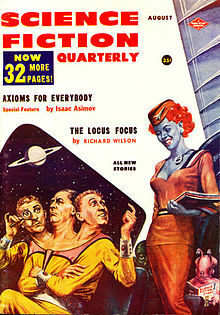 Asimov's Science Fiction. 36 (12): 6–8. — (January 2013). "The Raft of the Medusa" (PDF). 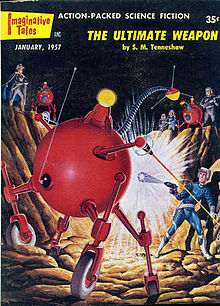 Asimov's Science Fiction. 37 (1): 6–8. — (February 2013). "Looking for Atlantis" (PDF). Asimov's Science Fiction. 37 (2): 6–8. — (March 2013). "The year's best science fiction" (PDF). Asimov's Science Fiction. 37 (3): 6–9. — (April–May 2013). "My desk" (PDF). Asimov's Science Fiction. 37 (4&5): 6–8. — (June 2013). "'... Not even wrong'" (PDF). Asimov's Science Fiction. 37 (6): 6–8. — (July 2013). "John Frum, he come". 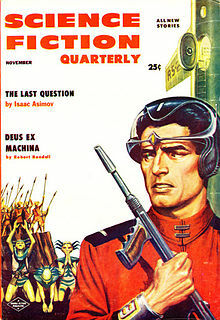 Asimov's Science Fiction. 37 (7): 6–9. — (August 2013). "Rereading Simak". Asimov's Science Fiction. 37 (8): 5–8. — (September 2013). "Translations". Asimov's Science Fiction. 37 (9): 6, 8–9. — (October–November 2013). "Translations II". Asimov's Science Fiction. 37 (10–11): 8–11. — (December 2013). "The plurality of worlds". Asimov's Science Fiction. 37 (12): 6–8. — (Jan 2014). "The plularility of worlds : a contrarian view". Asimov's Science Fiction. 38 (1): 8–11. ^ "Bibliography: Blood on the Mink". Retrieved 2015-01-03. ^ "1967 Award Winners & Nominees | Science Fiction, Fantasy & Horror Books by Award | WWEnd". Worldswithoutend.com. Retrieved 2011-10-13. ^ a b "1968 Award Winners & Nominees | Science Fiction, Fantasy & Horror Books by Award | WWEnd". Worldswithoutend.com. Retrieved 2011-10-13. ^ a b "1971 Award Winners & Nominees | Science Fiction, Fantasy & Horror Books by Award | WWEnd". Worldswithoutend.com. Retrieved 2011-10-13. ^ "1969 Award Winners & Nominees | Science Fiction, Fantasy & Horror Books by Award | WWEnd". Worldswithoutend.com. Retrieved 2011-10-13. ^ a b "1970 Award Winners & Nominees | Science Fiction, Fantasy & Horror Books by Award | WWEnd". Worldswithoutend.com. Retrieved 2011-10-13. ^ a b c d "1972 Award Winners & Nominees | Science Fiction, Fantasy & Horror Books by Award | WWEnd". Worldswithoutend.com. Retrieved 2011-10-13. ^ a b "1973 Award Winners & Nominees | Science Fiction, Fantasy & Horror Books by Award | WWEnd". Worldswithoutend.com. Retrieved 2011-10-13. ^ "1975 Award Winners & Nominees | Science Fiction, Fantasy & Horror Books by Award | WWEnd". Worldswithoutend.com. Retrieved 2011-10-13. ^ a b "1976 Award Winners & Nominees | Science Fiction, Fantasy & Horror Books by Award | WWEnd". Worldswithoutend.com. Retrieved 2011-10-13. ^ "1977 Award Winners & Nominees | Science Fiction, Fantasy & Horror Books by Award | WWEnd". Worldswithoutend.com. Retrieved 2011-10-13. 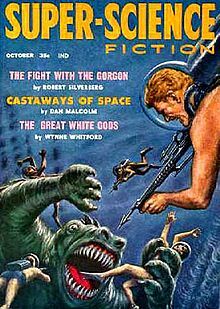 ^ Robert Silverberg bibliography at the Internet Speculative Fiction Database (ISFDB). Retrieved 2013-03-26. Select a title to see its linked publication history and general information. Select a particular edition (title) for more data at that level, such as a front cover image or linked contents. ^ "1999 Award Winners & Nominees | Science Fiction, Fantasy & Horror Books by Award | WWEnd". Worldswithoutend.com. Retrieved 2011-10-13. ^ "1981 Award Winners & Nominees | Science Fiction, Fantasy & Horror Books by Award | WWEnd". Worldswithoutend.com. Retrieved 2011-10-13.